Michael Finnefrock makes the case for removing rumble strips newly installed on North Williston Road on Tuesday in front of the Williston Selectboard. A safety enhancement project on North Williston Road got off to an inauspicious start this summer when the first element was installed incorrectly. Public Works Director Bruce Hoar admitted fault Tuesday in a presentation to the selectboard, acknowledging that the 2,000 feet of rumble strips installed in August is a longer stretch than the board originally approved. 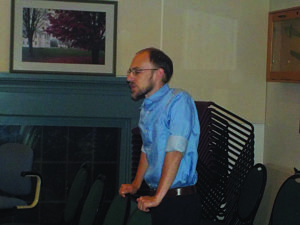 Michael Finnefrock, who owns a home at the corner of North Williston Road and Unity Lane, alerted the board to the issue at its Aug. 21 meeting; the unapproved rumble strips were installed in front of his home. The grooved pavement is designed to keep people in their lanes as the road curves through a hollow between Peterson and Fontaine lanes. It causes a rumbling noise when people cross the center line. “Unfortunately, my new reality is that noise every night,” Finnefrock said. Finnefrock described how he and his family have lo st sleep as cars cut corners on the curve, drive over the grooves and create the rumbling noise. The unapproved section is about a quarter-mile long. The board voted unanimously Tuesday to pave over the unapproved section. Finnefrock expects the noise to abate, but still expects to hear it from the 1,500 feet of rumble strips that remain. Williston Fire Chief Ken Morton also denounced the strips, saying emergency vehicles often cut corners through the North Williston Road hollow to improve transportation time. The strips will either cause emergency vehicles to stay in one lane, increasing travel time, or cause a disruptive jolt for patients and emergency medical providers inside an ambulance. “If you are trying to start an IV it makes it extremely difficult, and we’ve had that problem already,” Morton told the board. The planned enhancements to North Williston Road include a four-way stop sign at the Mountain View Road intersection, curve warnings signs entering the hollow and raised speed tables. They are scheduled to be installed before the end of the year. Finnefrock argued that rumble strips create a safety hazard because of North Williston Road’s curves and narrowness; when cars avoid going over the centerline, it squeezes cyclists and pedestrians. Also, the problem they are designed to address — preventing head-on collisions — hasn’t been an issue on the road, according to Morton. Finnefrock’s feedback prompted board members to take a closer look at federal guidelines for rumble strip installation. Board member Terri Zittritsch said federal guidelines show that North Williston Road is not wide enough for rumble strips. Hoar said he relied on input from consulting engineers at Resource Systems Group in Burlington to choose the safety measures in the project. He also consulted the Chittenden County Regional Planning Commission.